For movers, MoveWith serves as a partner in personal fitness, empowering people everywhere to customize their fitness journey, with coaches and workouts that fit their goals and lifestyle. The platform offers cardio-focused workouts like HIIT (high-intensity interval training), strength training, and running, as well as soul-inspired workouts like yoga, meditation, and even motivational talks. MoveWith’s mission to provide a 360° approach to fitness is encouraging users to achieve their personal best, which increasingly includes both a strong body and focused mind. Internal data reveals that 77% of users are taking classes across multiple categories, proving that the common goal of “getting and staying in shape” is more than just physical exercise, it’s also about mindfulness. MoveWith is the first platform to deliver an experience that enables users to do both. In less than a year since launching their audio fitness app, MoveWith has amassed over 600 boutique audio classes created by 30 world-class coaches, and a powerful mover community over 200,000 strong. “We started MoveWith to empower the athlete inside all of us, whether you are a weekend athlete, a high-intensity athlete, or a mindful athlete. We’re here to inspire you to move boldly each day, however, and wherever you want to move,” says Shelton. Unlimited Access Across Body, Mind, & Soul. 600+ high-intensity cardio and strength classes, soulful meditation and yoga flows, plus treadmill workouts and endurance runs. High-Quality Workouts You Can Depend On. Motivating, music-driven, coach-led, audio experience anytime, anywhere. A Team of Top Coaches Doing What They Love. More than 30 inspiring instructors provide motivation each week through new workouts and direct encouragement. Fresh, New Workouts Every Day. Fun, fresh audio workouts added each week, plus reach new milestones with seasonal programs and community-based challenges. Personalized Programs Deliver Results. Customized fitness experience with ready-made thematic workout collections to match any mood and deliver results. Boutique Fitness, Affordable Price. Available now for Apple devices, the MoveWith app offers a free trial, with premium membership available for purchase. Get the coaches, classes, and community of the boutique fitness world for $12.99/month or $95.88/year. To download MoveWith for free, visit the App Store, and for more information, please visit https://www.movewith.com/. MoveWith inspires active individuals to unlock their boldest, strongest self. Released in 2017, MoveWith delivers a boutique fitness studio experience digitally, empowering each mover to create a holistic fitness journey that fits their lifestyle - anytime, anywhere. 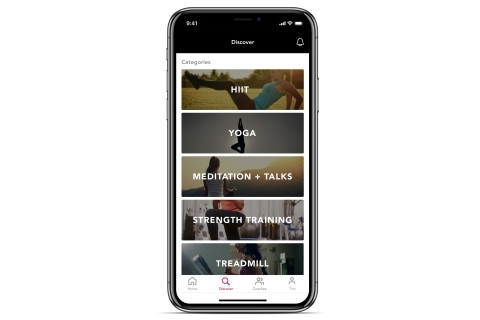 The app features audio classes for mind, body, and soul across nine categories, such as running, strength training, HIIT (high-intensity interval training), yoga, and meditation - all led by best-in-class, professional coaches. MoveWith is transforming every aspect of how fitness experiences are created and consumed with a direct-to-consumer model, powered by independent, world-class coaches. MoveWith Inc. is based in San Francisco. For the latest information and ongoing updates, please visit MoveWith’s website or follow on Instagram and Facebook. MoveWith, the coaching app with killer audio workouts for body, mind, and soul, is transforming the fitness experience for coaches and movers.